I have a weakness that I’m a little embarrassed to admit. I subscribe to a blog that posts photos of cute animals, gleaned from the blogosphere. It’s shameful, I know. I can’t really believe that I’m “one of those people”. But I have to admit, among all the day to day frustrations and exhaustions of running my own business, of meeting deadlines, of writing invoices, of worrying about the next job, of worrying about the impact my expired printer cartridges will make on a planet already groaning under mountains of discarded plastic, I was surprised by how much of a mood lifter a photo of a hedgehog, its head stuck in a toilet paper roll and its little pink toes pointing skyward, could be. I love animals. I grew up on a farm, surrounded by dogs and cats, guinea pigs, rabbits, lambs, pigs, chickens (we’ll get to chickens in a future post), horses etc etc… Of course, most of that list was destined to land on the table (dinner often had a name when I was a kid). At any rate, there was always something warm, furry and happy to see me even on my darkest of childhood days. I miss having a dog. I’ve taken to staring at people’s dogs when they walk by the studio or when I see them in a park. I smile at puppies. I’m like one of those creepy women who fixates on other people’s babies. 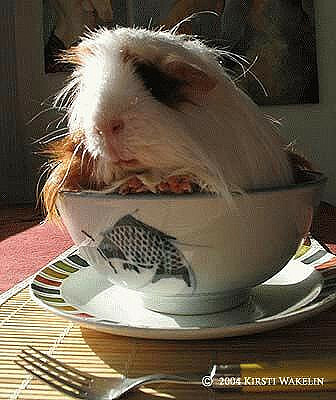 I had a guinea pig for a while a few years ago. Its teenage owner had grown bored of it and left it in its little crate all day. I took it over – smuggled it up to my no-pets-allowed apartment and renamed it Tosca. 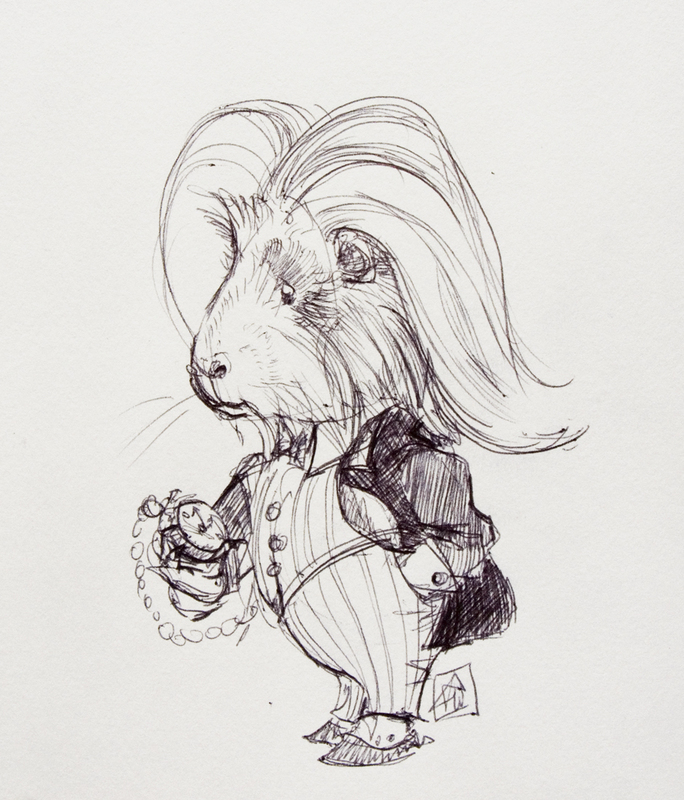 Tosca, who I later determined was actually a boy, not a girl as he’d lived his first few years of life, was a pretty unadventurous guinea pig. 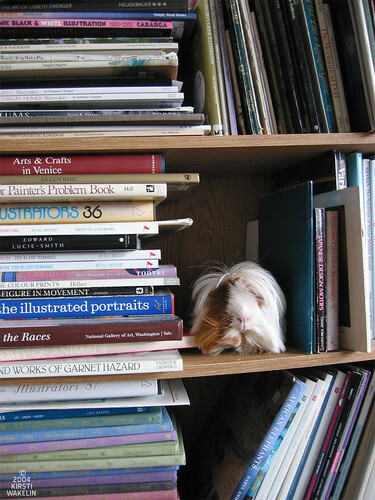 I recalled the guinea pigs of my childhood as playroom raiders – getting into all sorts of stuff. All my childhood dolls are missing fingers and noses as proof of their escapades. But Tosca, used to his 1’6″ x 2″ pen, was terrified of open spaces. He hugged the wall and refused to frolic. A network of covered bridges built out of cardboard boxes soon ran up and down my hallway, enabling him to scamper through them like some wild-haired subterranean spy. Tosca lived a couple of years with me before succumbing to old age and passing away peacefully one night. I love Tosca as the White Rabbit!